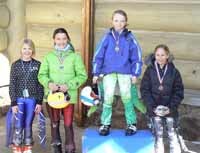 Another successful season for the Sun Valley Ski Education Foundation's C-Home Team Mini World Cup wrapped up last weekend on Dollar Mountain with speed races for 72 young racers ages 8-10. Wyatt Minor, Lily Fitzgerald and Libby Kaiser won the boys' and girls' super giant slalom and downhill events. Emerging as the overall season champions were Lily Fitzgerald and Jake Blackburn. This season featured some new wrinkles. The results pleased head coach Adele Savaria. She said, "Our inaugural Skills Test Feb. 6 was great. There were kids in the top five who hadn't been there yet. It was a great addition to our Mini World Cup series. "All of the kids showed some amazing skiing in the super G and DH this past weekend. They broke their own speed barriers and had a tremendous amount of fun doing it. We saw some different names on the podium. We're very proud of all the kids and their hard work." Skills Test: 1—Lily Fitzgerald and Jake Blackburn. Season champions, girls top 5: 1—Lily Fitzgerald 460 points. 2—Maddie Ferris 360. 3—Libby Kaiser 295. 4—Lucy More 210. 5—Sylvia Cogen 168. Boys top 5: 1—Jake Blackburn 440. 2—Wyatt Minor 360. 3—Will Griffith 320. 4—Charlie Stumph 295. 5—William Everitt 202. Girls' super giant slalom (best of 2 runs): 1—Lily Fitzgerald 39.13 seconds. 2—Maddie Ferris 40.56. 3—Lucy More 40.73. 4—Libby Kaiser 40.75. 5 (tie)—Kaia Jensen 41.59 and Laine Allison 41.59. Boys' super giant slalom: 1—Wyatt Minor 39.57 seconds. 2—Charlie Stumph 39.85. 3—Jake Blackburn 40.08. 4—Will Griffith 40.16. 5—William Everitt 40.68. Girls' downhill: 1—Libby Kaiser 33.65 seconds. 2—Lily Fitzgerald 34.07. 3—Lucy More 34.18. 4—Miren Sanchez-duPont 34.44. 5—Remy Vernoy 34.56. Boys' downhill: 1—Wyatt Minor 32.68 seconds. 2—Jake Blackburn 33.39. 3—Will Griffith 34.15. 4—Bennett Snyder 34.53. 5—William Everitt 34.67.